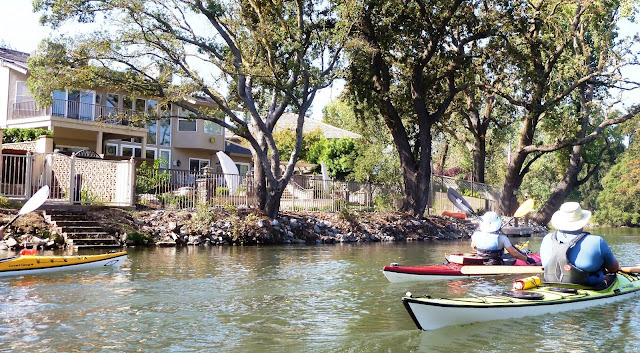 Paddling on the Mokelumne with a glimpse of "Lifestyles of the Rich and Famous"
Kayakers and others who use California’s lakes and rivers increasingly find they are unable to reach the water, encountering “no trespassing” signs, fences, walls, and other obstructions to public access. That’s the thrust of an investigation by Sacramento Bee environmental reporter Matt Weiser, published on Sunday (3/25). Public access to California’s coastline has been a contentious issue for decades. But Weiser’s story spotlights a more gradual erosion of public rights on inland waterways. The story offers examples from Cache Creek in Yolo County, the Delta, and Battle Creek in Shasta County, where a woman who tried to monitor water quality was threatened with arrest after a logging company accused her of trespassing. Weiser’s excellent report also notes that access rights may be difficult to prove, especially along the Delta. That’s certainly evident on the Mokelumne River in Lodi, where NorCal Yak joined a day tour last fall. Palatial homes line the river with “no trespassing” signs, fences, and walls in abundance. Community efforts to open more public access have gone nowhere, as yet. So what’s to be done? In the short term, says the Bee report, paddlers and others should go out of their way to be courteous and respectful when dealing with private property owners. Noise, trash, and other annoyances are not the way to win friends and access. Taking the longer view, kayak clubs, outfitters and other water enthusiasts need to establish a good rapport with their city councils, county supervisors, and local government planners. We need to remind them that public access to our waterways isn’t optional – California’s Constitution has guaranteed it since 1879.